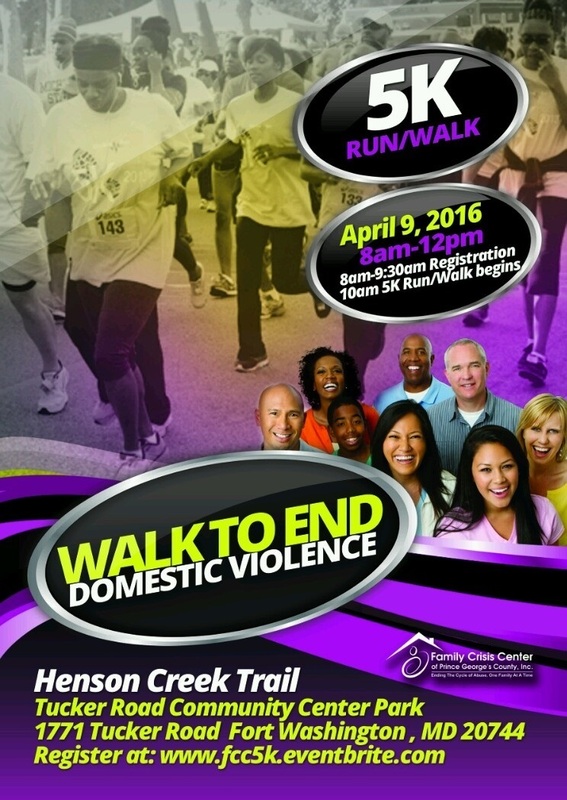 (March 9, 2016 – Fort Washington, MD) The Family Crisis Center of Prince George’s County, Inc. is combating the local domestic violence crisis. 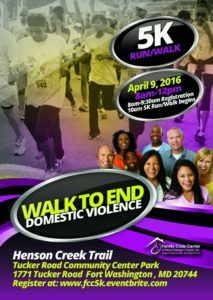 The Center will hold its 5K Walk to End Domestic Violence on April 9 at Tucker Road Community Center Park’s Henson Creek Trail on 1771 Tucker Road, Fort Washington, MD 20744. “This walk is imperative because our community is in a state of crisis, and we have to come together to stop the domestic violence epidemic,” said Sophie Ford, Executive Director of the Family Crisis Center. According to the Maryland Network Against Domestic Violence, Prince George’s County produces the most domestic violence emergency calls and domestic violence-related deaths in Maryland. From July 2014 to June 2015, 42 victims died in Maryland; 14 of those were from Prince George’s County. “This walk will bring much needed attention to this issue in a festive but educational environment,” Ford said. “The 5K Walk to End Domestic Violence, and awareness events like it, are important because they keep the conversation in the forefront beyond October (Domestic Violence Month). In Prince George’s County, we’ve had a recent influx of fatalities due to intimate partner violence, and so this event will be a timely effort that shows victims that they don’t have to suffer in silence,” said Natasha T. Brown, Founder, 10 Blessings/10K Survivors. “There is a community here to provide the support/services they need. Services that at one point in my life I needed as a victim of domestic violence. Awareness events, such as this one, could potentially save a life,” Brown continued. “Institutions like ours are taking a stand against violence and using partnerships to expand our reach so that no one falls through the cracks. The time to suffer in silence is over,” Ford said. The Family Crisis Center of Prince George’s County, Inc. is a 501c3 non-profit organization established in 1981 as a place for victims and children to flee domestic violence. Over the years, the organization has expanded by providing services to both survivors and perpetrators of domestic violence. To learn more about the 5k Run/Walk or the Family Crisis Center of Prince George’s County, Inc. please visit the Family Crisis Center of Prince George’s County, Inc. website.